#APMS Entrance Test 2019, AP Model Schools 6th Class Entrance Test 2019 Notification, AP Model Schools VI Class Admission Test 2019, AP Model School Admissions 2019-2019, APMS CET 2019: The C and DSE AP has published the AP Model School 6th Class Entrance Test 2019 Notification in January 2019 for admission into VI class in Model Schools in AP for the academic year 2019-2019. 6th Class Entrance Test Online Applications are invited from the eligible students for appearing the AP Model Schools Admission Test 2019, which will be conducted on 08-04-2019 as per their schedule. 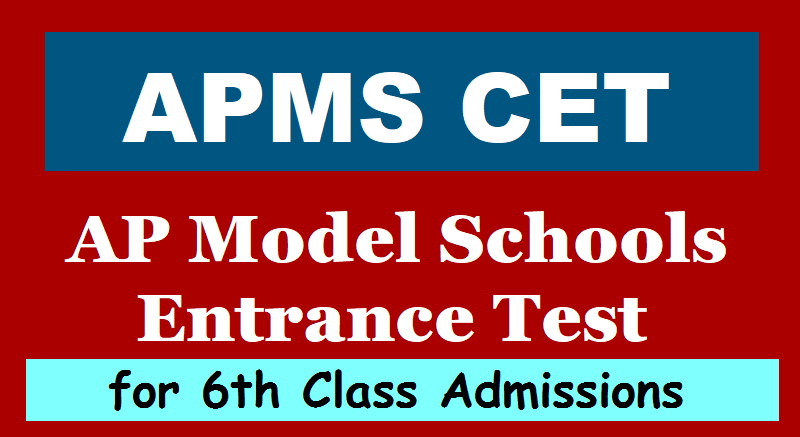 AP Model Schools 6th Class Entrance Test 2019 Schedule, Eligibility Criteria, Selection Procedure, How to Apply, Online Application Form, Fee Details, Exam Date, Last date and guidelines details are given in this notification. AP School Education Department officials have given instructions and guidelines to all AP Model Schools Principals for conducting the APMS 6th Class Entrance Test for Admission into AP Model Schools for 2019-2019. APMS-RMSA-Proc.Rc.No.550-Dt.11.01.2016 Subject: A.P.Model Schools -VI Class Entrance Test for Admission into A.P.Model Schools for the Academic Year 2016-17-Instructions for giving wide publicity - Orders - Issued. ORDER: All the Principals of A.P.Model Schools are informed that a Press Notification was issued for conducting VI Class Entrance Test for admission into 164 A.P.Model Schools in the State. Only few candidates have take fee for the entrance test further it is informed that, unless wide publicity about the test and the advantages it studying in Model schools poor parents will not come forward to join their children's in model schools. As such the following instructions are issued to all principals in model school's to put their efforts more enrollment of students to 6th class Entrance test. 1. A post Note to be issued in local news papers under news item. 2. The service of PGT and TGT may be utilized for visiting interior villages when primary schools are located in the catchment area of the model school this advantages in taking admission into model schools should be Explained to parent's I.e free education, free books,free uniform, free food in the offer noon (midday meals),good infrastructure facility, highly Qualified teachers,extra study hours, particularly stressing that the medium of instructions is in English. 3. The parents to be ensured that once the admission is taking in 6th class. the entire Education of their children's up to 2nd year intermediate will be looked after by the Government. 4. Pamphlets to be printed and distributed in surrounding villages of Model schools narrating the advantages in studying Model schools. 5. Flex is may be displayed in important places i.e in O/o MRO,MDO,MRCs and in village secretaries. All the principals of Model School's are requested to take necessary step for giving wide publicity on 6th class Entrance Test. The steps taken by the principal should be informed to the under signature on or before 18.01.2019 through mail for taking further in their matter.